Each year at the Seder, Jews read this line in the Passover Haggadah, "In every generation, a person is obligated to see themselves as if they had left Egypt." I love this concept, because it evokes both empathy for what our forefathers and mothers have suffered, and – more importantly – a lesson for us, for our present and future. The lesson is that change is possible, that we are masters of our fate, and that with determination and courage we can accomplish liberation. In our generation, liberating Israelis and Palestinians from the yoke of the occupation, which is subjugating both societies, is imperative. And it is within our reach. This year, you can add flavor to your seder by sharing this thoughtful reflection by Rabbi Michael Feshbach. Rabbi Feshbach has graciously contributed our 16th haggadah insert. In it, he asks us to reflect upon what Elijah's cup - the symbol of full redemption - means. 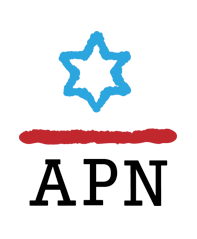 Since 2001, Americans for Peace Now has asked rabbis from the extended APN family to contribute reflections on the haggada: that story which has for centuries been understood as the archetype of liberation. Many of us have made these reflections a permanent part of our seder - we hope you will, too.You can find them here. To be recited as we prepare to open the door for Elijah. Rabbi Michael L. Feshbach is the Senior Rabbi of Temple Shalom of Chevy Chase, MD and a Senior Rabbinic Fellow at the Shalom Hartman Institute. He previously served congregations in Boca Raton, Florida; Erie, Pennsylvania and Buffalo, New York. A native of the Washington D.C. area, he is the author of numerous articles and book chapters, and he blogs at faces-in-the-mirror@blogspot.com and for The Times of Israel. We say that there are four cups of wine at the seder. These are four cups based upon the promises in Exodus: "I will free you from the labors of the Egyptians; I will deliver you; I will redeem you; I will take you to be My people." But there is, of course, a fifth cup of wine at the Passover seder. And there was a fifth promise. The cup is Elijah’s cup. And the promise was "I will bring you into the land." But God did bring us into the land. We came, we conquered, we settled... and then we lost and left again. Elijah's cup sees coming into the land as a promise held out for the future. If so, then this cup, this tradition, this seder itself has to have its origin at a time when we were no longer in the land. It had to have taken shape after the destruction of the Second Temple, in the year 70 – or, perhaps, even later, sometime in the second century. But we are back, now. So if "coming to the land" was the criterion for the fifth cup, should we not now, after 1948, after the declaration of independence of the Third Jewish commonwealth, after the birth of the modern state of Israel, should we not perhaps now drink the fifth cup? Has the promise been fulfilled? Except that... over time, the cup of Elijah has come to stand for a future hope of something deeper than mere presence. It is about redemption. It is about setting things right, and things being the way they are supposed to be. And we are not, now, in a place of full redemption. To truly share this cup we must find a way to truly share this space. For we know if the state of Israel is reishit tz’michat ge’ulateinu, the first flowering of redemption, still we know, and sadly we see ... that redemption is not yet complete. "Being there" alone is not enough. The suffering of others, the pain of the Palestinians, has to be part of our world, brought into our minds and our hearts before we can fully taste the sweetness of the final cup. So still we look to a future day, when we will dwell in peace, in two states, and the swords shall be beaten into the plowshares... and none shall make anyone --them or us-- afraid*. "...and they shall beat their swords into plowshares, and their spears into pruninghooks; nation shall not lift up sword against nation, neither shall they learn war any more. But they shall sit everyone under his vine and under his fig-tree; and none shall make them afraid..."
Click here to see all the haggadah inserts from previous years. Haggadah Insert: An honest reckoning. Haggadah Insert: The spirit of DAYENU.